Cirdan is continuing to invest in its future growth within the precision medicine market, creating 46 new jobs over the next four years and undertaking a major multimillion pound R&D project. The R&D project, which is in collaboration with Northern Ireland’s Molecular Pathology Laboratory (a hybrid partnership between QUB-CCRCB and the Belfast Health & Social Care Trust), will enable Cirdan to develop new precision medicine focused product solutions to meet the future needs of existing and new customers alike. Professor Manuel Salto-Tellez and Professor David Gonzalez de Castro, from the Centre for Cancer Research and Cell Biology at Queen’s University Belfast , will lead the collaboration with Cirdan. Hugh Cormican, Cirdan CEO said: “Hospital laboratories are undergoing a major transformation as they adopt to the new workflows and instrumentation required for the emerging precision medicine model of healthcare. Working with QUB, Cirdan intends to be at the forefront of this change and supporting laboratories globally to meet this demand. 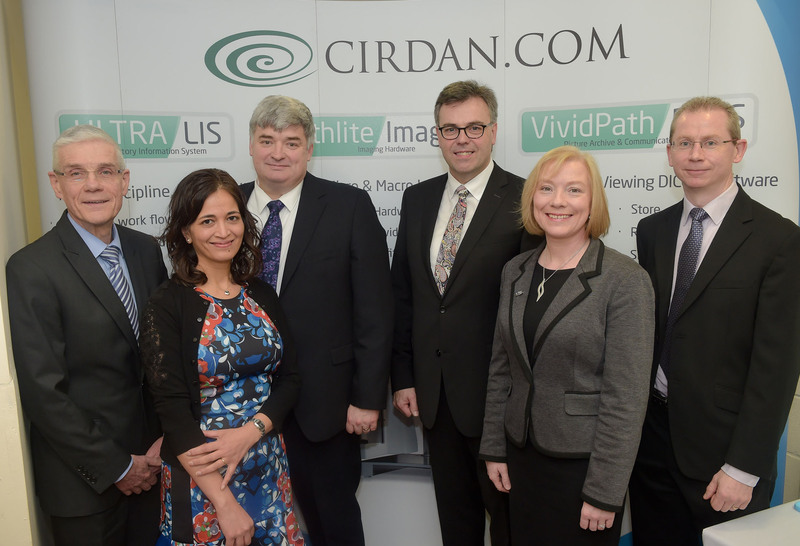 Featured Photo (L-R): Dr. James Gerald Doherty, Cirdan Chairman; Samana Hussain-Brannigan, Technology Executive, Invest NI; Dr. Hugh Cormican, Cirdan CEO; Alastair Hamilton, Invest NI Chief Executive; Dr Frances Weldon, Queen’s University Belfast and Stephen Dunniece, Cirdan R&D Director.